Mickelson was bogey-free with six birdies, and he made his big run starting with a 9-iron to a foot behind the cup on the par-4 ninth. That was start of a five-hole stretch where Mickelson made three birdies and Paul Casey had two bogeys. The final round started an hour late because of rain, and then it was delayed two more hours when sunshine gave way to a hailstorm in a matter of minutes, covering the putting greens in a sheet of white. Casey was at 15-under, tied with Scott Stallings, who closed with a 66. Along with an outside chance at forcing a playoff, finishing alone in second instead of a tie is a difference of $152,000, plus FedExCup and world ranking points. Casey and FedEx executive Don Colleran had a one-shot lead in the pro-am. 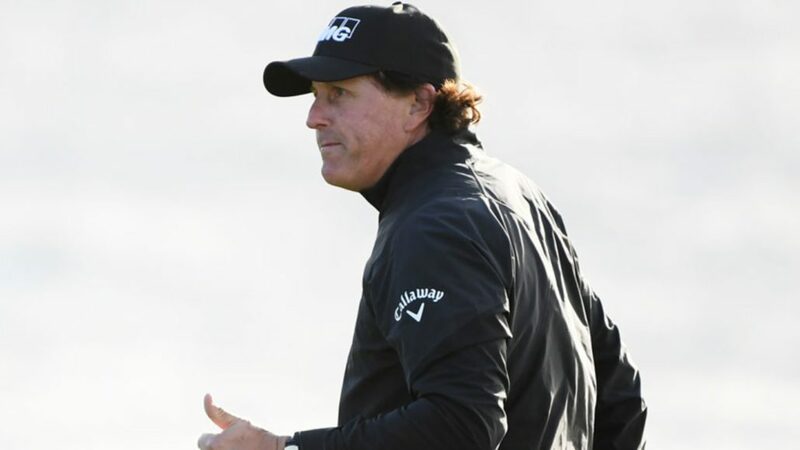 Mickelson is on the verge of winning for the 44th time in his career, and matching Mark O’Meara with five victories at a tournament where he first played in 1995. It also will be his first victory on American soil since the Waste Management Phoenix Open six years ago. He won The Open Championship that summer in Scotland, and the World Golf Championships-Mexico Championship last year. His brilliant play still shared the stage with weather that was bizarre, even by Pebble standards. Mickelson and Casey were waiting to tee off when clouds moved in quickly, and rain turned into hail that pounded umbrellas, many of them held sideways to account for the wind. South Africans Ernie Els (71) and Branden Grace (74) will share 28th place.